iPhone is unarguably the best smartphone device available in the market. The growth and Apple devices are tremendous as a result there are plenty of Apps available for them. However, it’s users always have dilemma what are the apps that they should have on their iPhone. Flipboard curates content from social networks, websites magazines to blogs, and completely transform them into stunning magazine-like digital pages. Although, it is more apt for iPhone, as the user can take full advantage of all the possible swiping gestures with both visual and interactive grace. On the iPhone, it’s still quite elegant. To download, Click here. Flickr is almost anything you can do on the app you’re used to. The new Flickr iPhone app featured shooting, basic editing, uploading, discussing &browsing. Flickr iPhone App is the best way to share photos&activity like editing & uploading. Flickr iPhone App is the best way to share photos&activity like editing & uploading. To download, Click here. Pinterest iPhone app is a virtual pinboard which allows users to organize and share all their pictures of anything they find online. With the help of this app, iPhone users can easily snap photos in the real world and upload them to your boards. It’s certainly the great tool for collecting and browsing images of things which iPhone user inspired. To download, Click here. Facebook is most popular social media network site. 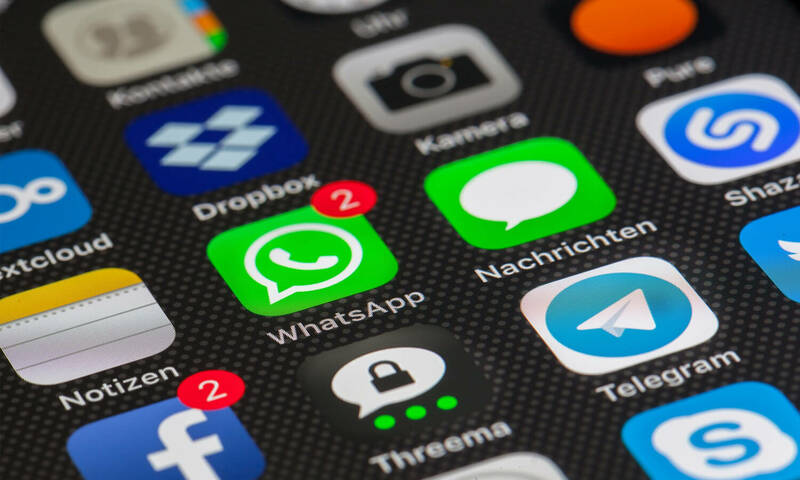 This iPhone app is must-have for nearly anyone, as many other social apps connect through Facebook to acquire vital information and do like, share, tag and all other regular Facebook stuff. To download, Click here. Snapchat is most famous instant photo-sharing app which allows iPhone user to take photos and send them to friends, who can see them for a maximum of 10 seconds before they disappear. It is the perfect way to share quick snaps and instantly share with friends! To download, Click here. WhatsApp is a great way of communication. The app let’s iPhone users to send and receive messages, pictures, audio as well as video messages. Moreover, the advanced what’s app version allows used to conduct video calls and voice calls from and distant places. To download, Click here. More than 250 million users use Skype worldwide. The app is most trusted for communication. Skype allows chat, voice and video calls and connects users all over the world which may be using separate devices for the communication. The user can also send emoji, pictures and transfer important data between two or more devices. To download, Click here. The Instagram iPhone app allow users to snap photos or shoot short videos, edit them, and share them on Instagram or other social media platforms like Twitter, Facebook, etc. The app is more popular among the young generation.To download, Click here. The buffer is an iPhone app and browser extension that helps users to schedule posts on their Facebook, Twitter, LinkedIn, and other social media accounts. The latest version also supports for native re-tweets. To download, Click here. Dropbox is useful for more than business documents and presentations. iPhone user can upload music to their Dropbox account and listen to it from iPhone, iPad, or other computers. The best part of this app that everything the app store remain in the cloud, so it doesn’t take space on the iPhone. To download, Click here. Evernote is free, straightforward most used note making apps which have strong search capabilities and easy option for the organization. But the part of this app is that it synchronizes all the files by saving them to a cloud service, meaning anything you create or alter from iPhone will be waiting for mobile phone users when they log into any other version of Evernote. To download, Click here. Shazam is must have iPhone app used by hundreds of millions of people to instantly identify music that’s playing and also check what others people are discovering. It is a mobile app that recognizes music, TV, and media around you. It allows users to Share favorite discoveries with friends. Follow favorite artists and do much more stuff using this app. To download, Click here. SoundCloud is the one of the biggest music and audio streaming iPhone app. With a large community of singers and musicians uploading their latest music album. This app is also the best way to find the chart-topping albums, live sets, which sets according to mood of the occasion. Moreover, the app catalog allows the user to discover hip-hop, rock, classical, jazz, audiobooks sports with a touch of a button. The app offers a vast number of products for all listeners. To download, Click here. The TripAdvisor iPhone app is very simple, which is perfect for travelers. After all, you don’t want to waste precious vacation time trying to find some place to eat and helps at: you just want to know where to go right now. Set your current location with the app–or not; you can always manually type in your location and start finding nearby places. The app can search for hotels, restaurants and even book flights with a few taps. To download, Click here. Yelp is a wonderful iPhone app for getting local information about where to eat, drink, and shop. The App is more than useful to find places nearby, read or add reviews and photos, and get directions. Filters include price, distance, rating, most reviewed, and opening hours of that place. To download, Click here. The official BBC News iPhone app provides the latest news / stories from around the World directly into your iPhone. The app offers faster reports from BBC News in a compact and easy-to-access user interface brings you more content, more personalisation and high performance.. To download, Click here. IMDb, apps for Apple devices is the world’s largest collection of movie, TV, and celebrity information, has a nicely done iPhone application available for free in the App Store that has just gotten a whole lot better in the latest version 4.5 release. The app also gives technical specifications for movies like it’s aspect ratio, color, audio, runtime, and every small bit of information that users want to know. To download, Click here. SwiftKey is one of the most popular alternative keyboards available on iPhone. The app store the ‘Learned Language’ online so that user can use it across multiple devices. It comes with Smart prediction technology that makes mobile typing easier. To download, Click here. Uber is a most popular ride-sharing iPhone app that connects passengers with drivers. It allows privately hire a taxi with a driver with just single click. This app lets iPhone app user order a private driver with the click of a button. With Uber, the user can select between five categories of vehicles ranging from the economy (uberX) to luxurious (LUX). However, these options aren’t available in every city. To download, Click here. Mint app helps users to keep detailed accounts of their finances by connecting to all their financial accounts and tracking all the money you earn and spend. This iPhone app extends the experience so users can keep an eye on their daily and monthly spending while on the go. The app also gives insight into about whether that iPhone user is sticking to the budget created in Mint. To download, Click here. This app is an official Twitter app for the iPhone user. This iPhone app makes it easy and convenient to get on board the 140-character social network. Moreover, in iOS 5 and higher version, Twitter can directly integrate into the iPhone so that users can easily tweet photos or links that they want to share. However, for that this Twitter app is essential. To download, Click here. Dubsmash allows the user to have a fun by voice-overs or to mime popular internet videos and sounds. This iPhone app is full of fun. Moreover, the app is the perfect way to spend time with family and friends. The apps are free of cost and easy to use. To download, Click here. Dictionary.com is a digital English dictionary for iPhone devices. The app contains over 2,000,000 definitions complete with synonyms and acronyms. The app also allows users to save favorite words for easy reference later and translate words from other languages. However, the best thing about Dictionary.com is the option for iPhone user’s ability to buy additional specialized dictionaries to focus more on grammar, writing, science, medical, and more. To download, Click here. The eBay iPhone app is the easy and effective way to buy or sell items on the eBay online store. iPhone users can scan products to get info, compare prices or set up a store page instantly- even create a custom page with relevant details from scanned items. eBay notifications allow updating latest is happening in the online store. To download, Click here. Groupon iPhone app brings unbeatable deals for the best stuff to do, eat, stay, buy and see in more than 500 cities across the globe. Every iPhone user should download the Groupon app to get latest deals per their preferences. Whether you are looking for a new restaurant or try out the new salon, or wants to find a resort with family Groupon is surely best option. Moreover, Users can browse best offers for dining, spa treatments, fitness classes, and other nearby areas. To download, Click here. If you’re looking for such amazing iPhone apps developed for your business, click here to get in touch with Us at optimizedAPPS – iPhone App Development Company in California, United States.